Pyroglutamic acidosis is an uncommonly diagnosed but important cause of a high anion gap metabolic acidosis. Our case report concerns an elderly male admitted to the Intensive Care Unit (ICU) following the acute onset of coma which developed during treatment of a prosthetic joint infection. A diagnosis of pyroglutamic acidosis was ultimately made and later confirmed with laboratory testing. Blood gas analysis revealed a profound high anion gap metabolic acidosis. Treatment included withdrawal of the precipitating medications, N-acetylcysteine and sodium bicarbonate. This case highlights an unusual cause of severe metabolic acidosis caused by commonly used medications and readily reversible if recognised. This is of particular relevance in elderly, frail patients as incorrect alternate diagnoses may result in decisions which incorrectly limit critical care therapies. Pyroglutamic acidosis is an infrequently reported cause of a high anion gap metabolic acidosis1. It can arise from a combination of glutathione depletion and impaired pyroglutamate metabolism. The cornerstone of management involves prompt recognition and withdrawal of offending drugs. Given the lack of a readily available diagnostic assay it is likely considerably under-diagnosed2. The ICU service was requested to urgently review an 83-year-old inpatient who had suffered an acute deterioration in level of consciousness. The patient had been admitted one month previously with right hip pain. His past medical history was significant for Type II Diabetes, hypertension, hypercholesterolaemia, chronic kidney disease, gout and prostate cancer. He had previously undergone a right total hip replacement following a road traffic accident. A prosthetic joint infection was diagnosed when a copious volume of pus was encountered during a planned revision of the hip prosthesis. Methicillin sensitive Staphyloccus aureus was cultured from the joint fluid and the patient was commenced on high dose intravenous flucloxacillin. He also received regular paracetamol analgesia. His post-operative course was complicated by an episode of sepsis immediately post-operatively. On review the patient was noted to have a Glasgow Coma Score of 3/15, a respiratory rate of 25 breaths per minute and normal haemodynamics. Arterial blood gas analysis revealed a marked metabolic acidosis with a pH of 7.19 (Table 1) and a bicarbonate of 5.6mmol/L with maximal respiratory compensation (PaCO2 2.05kPa). The anion gap corrected for hypoalbuminaemia was 41mmol/L. Lactate levels were normal and urinary ketones were not detected which excluded lactic acidosis and diabetic ketoacidosis respectively as likely causes. A normal osmolar gap made alcohol ingestion an unlikely diagnosis. A diagnosis of pyroglutamic acidosis was made empirically. Flucloxacillin was switched to cefazolin and paracetamol was discontinued. A continuous infusion of IV N-acetylcysteine was commenced to replenish hepatic glutathione stores and boluses of sodium bicarbonate were given initially to normalize the pH. Shortly afterwards continuous renal replacement therapy was commenced to facilitate correction of the metabolic abnormalities. Within 48 hours the patient had demonstrated neurological improvement and was discharged from the ICU several days later alert and orientated. The patient was subsequently transferred to a convalescence facility. Urinalysis for organic acids retrospectively confirmed the diagnosis. Pyroglutamic acidosis results from disruption of the γ-glutamyl cycle (Figure 1) that is involved in the biosynthesis of glutathione3. 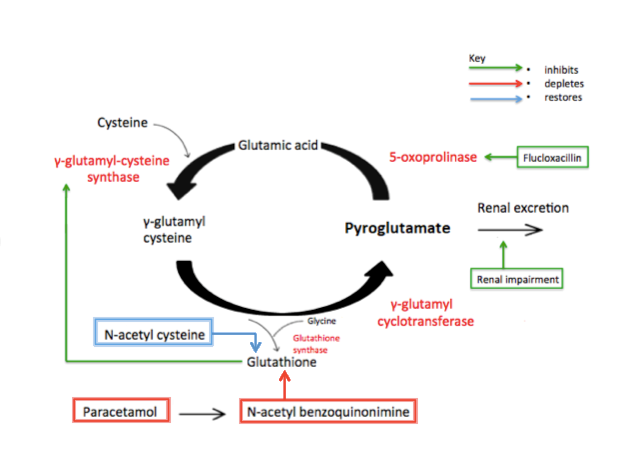 Malnutrition, liver disease, sepsis and paracetamol administration reduce glutathione levels which, through a negative feedback loop, contributes to the accumulation of pyroglutamate. Flucloxacillin directly inhibits the enzyme responsible for the degradation of pyroglutamate (5-oxoprolinase) and renal failure impairs pyroglutamate clearance. The risks of concurrent paracetamol and flucloxacillin use have recently been highlighted by the Irish Health Products Regulatory Authority4. The typical patient is elderly, female and frail who is taking an extended course of flucloxacillin with regular paracetamol5. It is interesting to note that our patient immediately preceding his deterioration had developed impaired liver function (attributed to flucloxacillin) and further impaired renal function that perhaps contributed to the elevation of pyroglutamate levels. Interestingly the cause of coma is these patients is unclear. It is likely multifactorial; older age with underlying cognitive impairment, sepsis, and acidaemia. The acute rise in pyroglutamate levels may also have a depressant effect on the central nervous system6. The cornerstone of management relies on prompt recognition and withdrawal of offending drugs. Confirmatory tests are not widely available and results may not become available for many days. Intravenous N-acetylcysteine is administered to replenish glutathione levels and sodium bicarbonate may be necessary to correct severe acidaemia. In conclusion pyroglutamate acidosis should be considered in the differential diagnosis of a patient presenting with an unexplained high anion gap acidosis, particularly in the high-risk patient groups7. The authors confirm no conflict of interest. 1. Green TJ, Bijlsma JJ, Sweet DD. Profound metabolic acidosis from pyroglutamic acidemia: an underappreciated cause of high anion gap metabolic acidosis. 3. Fenves AZ, Kirkpatrick HM, 3rd, Patel VV, Sweetman L, Emmett M. Increased anion gap metabolic acidosis as a result of 5-oxoproline (pyroglutamic acid): a role for acetaminophen. Clin J Am Soc Nephrol. 2006;1(3):441–447. 5. Katherine Myall, James Sidney, Aidan Marsh. Mind the gap! An unusual metabolic acidosis. The Lancet. 2011;377;526. 6. Croal BL, Glen AC, Kelly CJ, Logan RW. Transient 5-oxoprolinuria (pyroglutamic aciduria) with systemic acidosis in an adult receiving antibiotic therapy. Clinical Chemistry. 1998 Feb;44(2): 336-340. 7. Dempsey GA, Lyall HJ, Corke C F, Scheinkestel CD. Pyroglutamic acidemia: A cause of high anion gap metabolic acidosis. Crit Care Med. 2000;28(6):1803-1807.